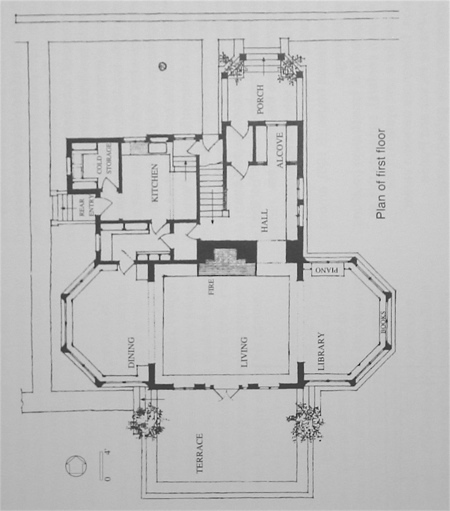 printed as Dover's "Country and Suburban Homes of the Prairie School Period," 1982). The plan is Fireproof/foursquare upstairs, something quite else down. The windows upstairs are double-hung ! PS -- von Holst gives exactly one page to Wright. . . Interesting DH window similarity to Winslow for the date; along with the broad hip. I wonder if double hung windows were stock and primarily a cost issue (although even many of the 4-square's had custom albeit simplified windows)? True about early photos-look how important the sloped stylobate base is to the composition. For all the developing organic intent, Wright early on seemed to not want even Mother Nature imposing upon his designs. And it's hard to argue with him! The Charles A. Brown Residence is quite beautiful. I think so. Rustic below, refined above (in wall treatment, that is). The desire for breadth is met in a quite overt way, here. 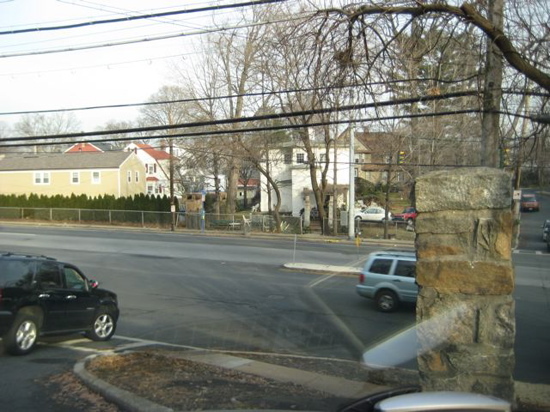 Note apparent lack of neighboring structures. I suppose the DH sash could have been the client's wish ? 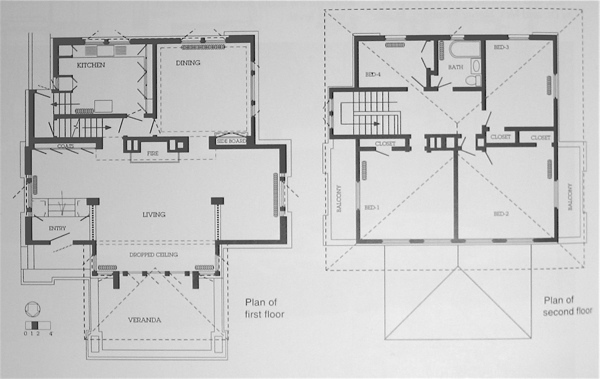 But there are casement windows indicated throughout the first floor. Maybe ever-restless FLW was playing with an idea of complete contrast between upper and lower volumes ? He said that he first wanted to see the house sitting ON the ground. That seemed to change when he got to hill country, I guess ? This house has a full basement. I saw a recent photo of the house on the internet and it was overgrown with landscaping. FLW buildings were never intended to be hidden by the landscaping. 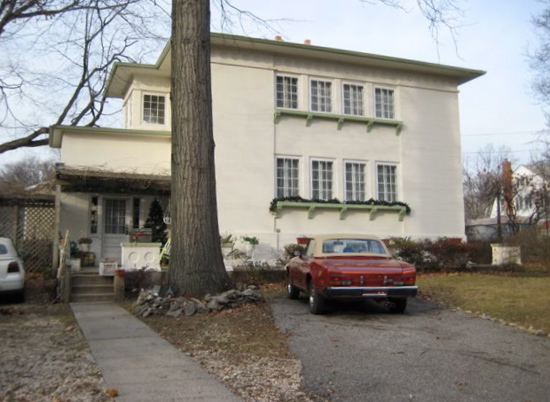 The Brown House would be such more impressive if one could just see it as it was envisioned by Frank Lloyd Wright. I don't recall seeing or reading about ground cover as an alternative to shrubbery around Wright's houses -- but I certainly agree that it's a detriment to them to be hidden in any way. Charlie Brown is a hybrid of the Fireproof House and the Cheney House type (of which there are numerous examples) with its tripartite living space. Instead of the almost incidental entry of the typical Fireproof House, Brown has a surprisingly grand entrance which is balanced at the other end of the house by a library(?). Together with the central living room, they compose a space much like the library-living-dining room of Cheney, Hickox, Henderson, etc. albeit at a more modest scale. I can't think of another example of this layout offhand. 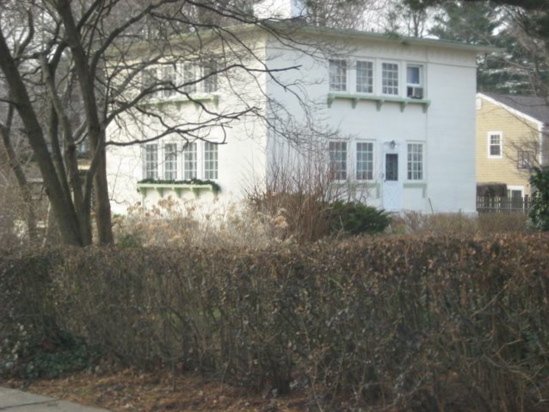 The current owner of the Charles Brown House (which now is in a typical neighborhood with houses close on either side) has planted a really beautiful Japanese garden in the front, which obscures the base of the house but does afford a lot of privacy from tourists. One of the many things that I like about the Brown House is the way that wood clad mass extends beyond the plaster walls to create the balconies on both sides. 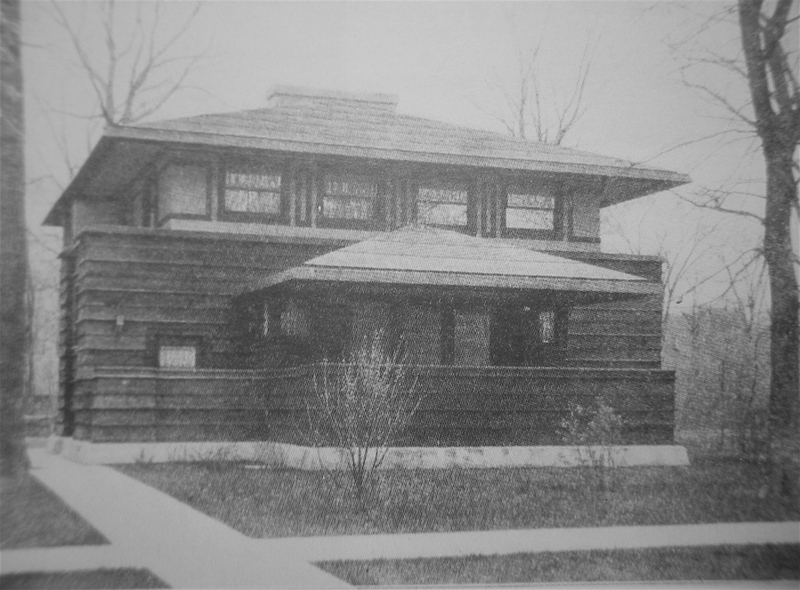 This is another wonderful formal idea that Frank Lloyd Wright took from Louis Sullivan. One of the unfortunate things about the house is the way that the sideboard isolates the dining room from the living room. I am sure that this came from the client and FLW hated it. On other comparable houses he consistently opens the dining room up to the living room. 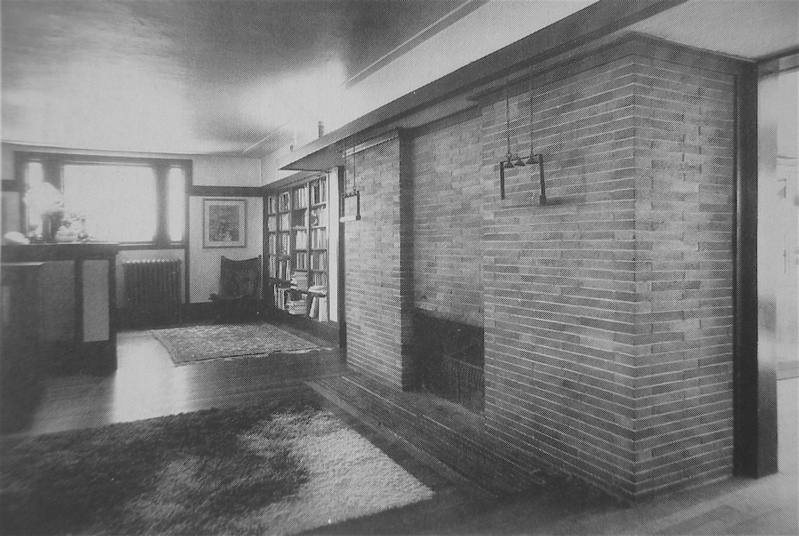 Storrer's photo of the living room seems to show the absence of a spindled (?) screen at the far left. I find no other photos of the house. . .
Maybe they were removed. They certainly would add a lot to the design. quality about it that filters daylight in a very beautiful manner. 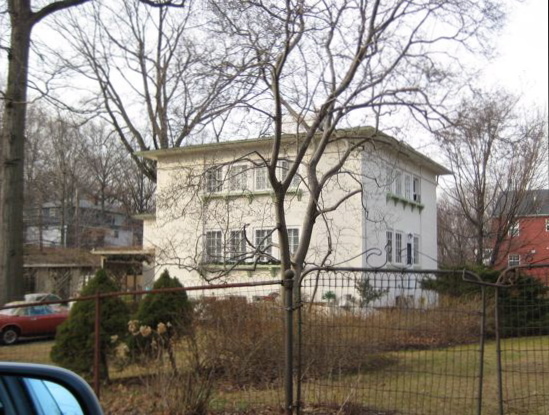 It is similar to Louis Sullivan's Charnley House. Other Louis Sullivan design influences in addition to the square spindle screen on Davenport include Curly Pine door panels from the Sullivan cottage, Bower-Barf hardware finish from the Auditorium Theater, and the running head trim from the Charnley House. 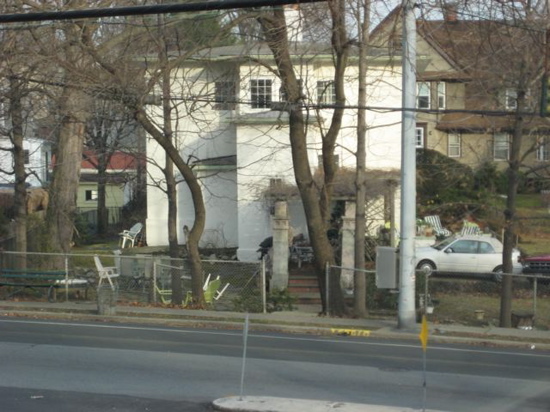 Paul Ringstrom forwards these photos by Frank Ambrosino of the Mamaroneck house. 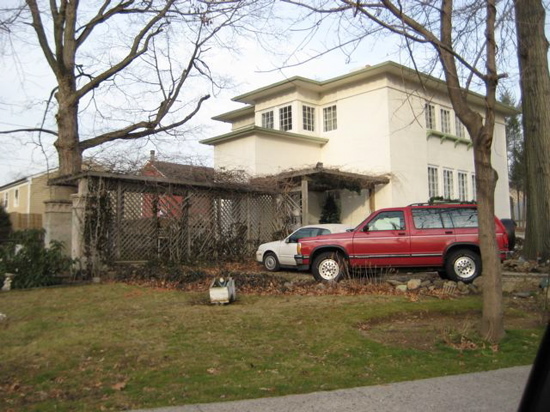 Note the attempt to include the entry pergola "tail" that Wright provided in the "Fireproof House for $5000." So, what we have is a (very) early bonafide Bad Copy of a Frank Lloyd Wright design. . .
Its interesting that times change, but people don't. I've lost count of how many times I met with a client that comes in with a picture, magazine clipping, or even a copy of a floor plan for which they want me to "draw up a set of blueprints". In the end, once we review the site and what the client really wants and needs, the result is unique and much better suited to the client. Rarely does the result bear much resemblance to the original clipping. These "bad copies" probably resulted from clients pointing at the FLLW article in a period mag and saying, "I want this", to a local builder or architect. I imagine that is the case. 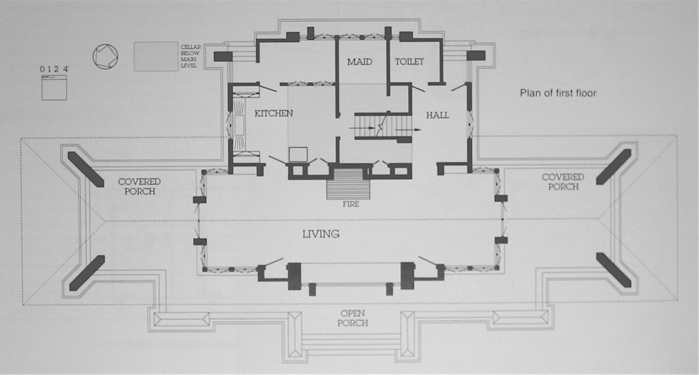 An architect who -- on his own -- proposed such a copy/homage/rip-off would have come closer to Wright's vision. Either that, or this architect -- C C Crossley, according to jackless -- had quite poor eyesight !